The energy sector is historically out of favor, representing a very small weight in major indices. Much like REITs in the late 1990s, the energy sector is loathed today. This downtrodden status is the birthplace of opportunity. Equities with the best appreciation potential are the most out of favor. 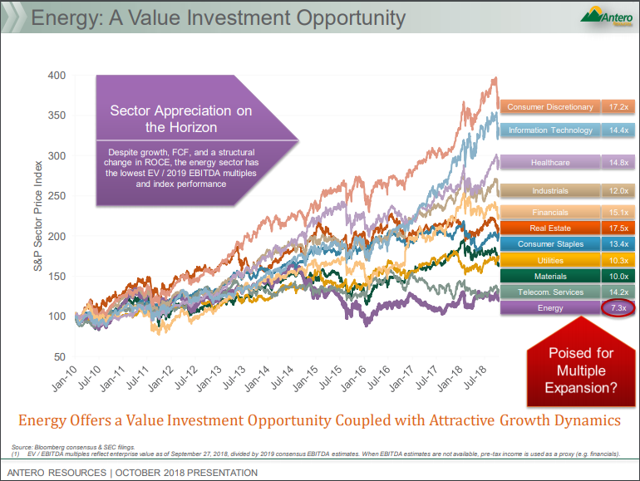 Starting valuations are very important for future returns, and the energy sector has the lowest starting valuations of any sector in the market today. A 60:40 allocation to passive long-only equities and bonds has been a great proposition for the last 35 years …We are profoundly worried that this could be a risky allocation over the next 10." The energy sector is historically out of favor, representing a record low percentage of the S&P 500 Index, as measured by the SPDR S&P 500 ETF (SPY). This out-of-favor nature is similar to the status of REITs in the late 1990s, which were loathed, and unloved, yet REITs, including household names today, like Simon Property Group (SPG), Realty Income (O), and W.P. Carey & Co. (WPC), have gone on to enjoy almost two decades of outperformance, aided and abetted by falling long-term interest rates. Simply buying a popular REIT index like the iShares U.S. Real Estate ETF (IYR) upon its debut in 2000 or the Vanguard Real Estate ETF (VNQ), which debuted in 2014, was a smart move, and investors buying the out-of-favor energy sector ETFs could be in position to reap similar rewards today, in my opinion. Digging deeper in the energy sector, the most out-of-favor energy equities offer the most opportunity, from my perspective. The key to determining the underlying value of energy equities, particularly the out-of-favor energy equities, is in discerning the value of their underlying assets. The good news for investors today is that the entire energy sector is on sale when viewed as a sector, and this is almost a prerequisite for future outperformance, as the following informative graphic shows. Stocks with low valuations have a lot of the negatives already priced in, which is a roundabout definition of value investing. 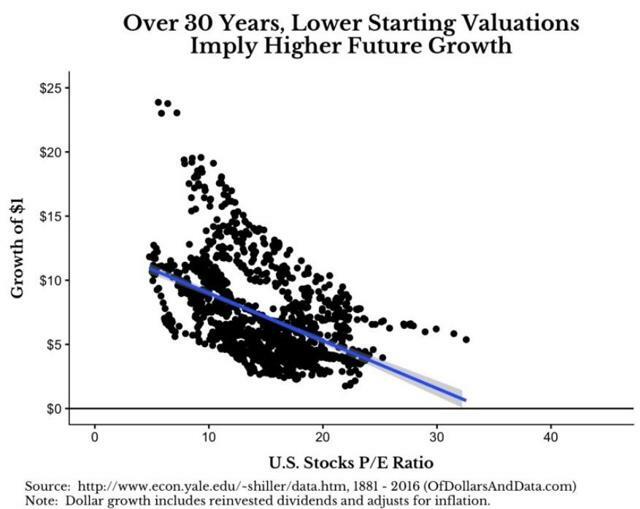 Obviously, growth has outperformed value for roughly the past ten years, similar to the U.S. stock markets returns from 1990 to 2000, so value investing is extremely out-of-favor, and energy stocks are one of the preeminent value sectors in the market today, offering outsized forward return opportunity, partly because almost all investors have shunned them already today. How cheap are energy equities? We will explore that more later in this article, but first, a background on the current investment landscape. Energy equities today are similar to REITs in the late 1990s, loathed and out of favor, yet this status obscures the tremendous return potential from today's low starting valuations. Even the best-performing energy equities, including Exxon Mobil (XOM), Chevron (CVX), and Schlumberger (SLB), have massively underperformed the S&P 500 Index over the past decade. The following performance snapshot of XOM shows its underperformance versus the S&P 500 Index, as measured by the SPDR S&P 500 ETF, and crude oil prices too, as measured by $WTIC prices, over the past decade. The underperformance of energy equities has led to the energy sector being a historically low weighting in the S&P 500 Index. At the end of the first quarter of 2019, energy equities represented 5.4% of the S&P 500 Index, with Exxon Mobil representing roughly 1.4% of the S&P 500 index, down from its 2.7% weight at the end of 2013, Chevron representing roughly 1% of the S&P 500 Index, down from its 1.5% weight at the end of 2013, and Schlumberger, which is the largest oil services company, representing roughly 0.25% of the S&P 500 Index. Building on this discussion, energy companies that are seemingly large, like Occidental Petroleum (OXY) and Anadarko Petroleum (APC), two of the larger independent energy producers, represent roughly only 0.21%, and 0.10% of the S&P 500 Index, respectively. 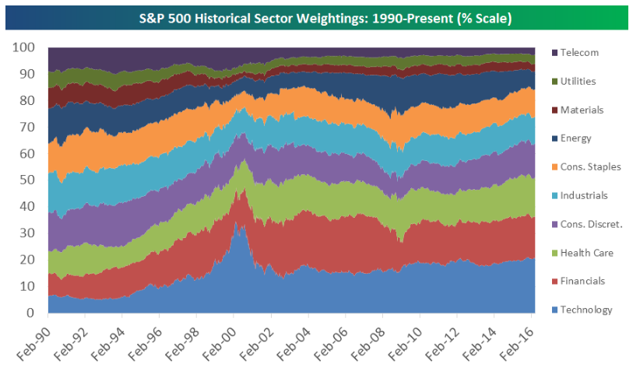 In summary, at roughly 5% of the S&P 500 Index weighting today, the energy sector is down from its roughly 10% weighting of the S&P 500 Index, or higher, which it occupied for a majority of the time from 1990 through 2013. Thus, even with the price recovery in oil prices from the $20s in 2016 to over $60 per barrel today, according to $WTIC prices, the energy weighting in the S&P 500 Index has gone down from 7.6% at the end of 2016 to 5.4% today. $WTIC oil prices are up roughly 42% in 2019, outpacing the strong 16% year-to-date gain in the S&P 500 Index. Since January 1, 2016, $WTIC oil prices are up 74%, outpacing the gain in the S&P 500 Index, which is higher by 51%. However, even with the 74% gain in crude oil prices since January 1, 2016, the leading energy sector ETFs, including the Energy Select Sector SPDR Fund (XLE), the SPDR S&P Oil & Gas Exploration & Production ETF (XOP) and the VanEck Vectors Oil Services ETF (OIH), have all underperformed the rise in $WTIC crude oil prices dramatically, in percentage terms, as shown below. XLE, which is dominated by the biggest energy equities, is up only 23.9% since January 1, 2016. XOP, which is more heavily weighted towards the smaller exploration and production companies, is only up 8.9% since January 1, 2016, and OIH, which is a basket of oil service stocks, is actually down -27.0% since January 1, 2016, despite the over 74% rise in crude oil prices during this time frame. Whether looking at the broad market, or individual equities, the price you pay is extremely important to your future return prospects. Interestingly, today, the broader U.S. equity market is historically overvalued, implying very sub-par future returns, which I personally believe will be negative on a real return basis over a long future time frame. 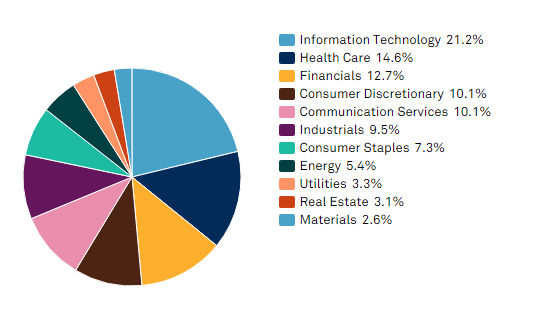 Against this backdrop, energy equities, which we demonstrated earlier are a historically small portion of the S&P 500 Index, are extraordinarily cheap, as an entire sector with the lowest EV/2019 EBITDA multiples (7.3x), by far, with REITs, interestingly, having the highest EV/2019 EBITDA multiples (17.5), followed by the defensive consumer discretionary sector. Digging deeper, the following are the current EV/EBITDA multiples (trailing twelve months) for all the energy companies in the S&P 500 Index, listed in order of their current market capitalizations. Looking at the companies highlighted above (with the bold shading indicating relatively attractive EV/EBITDA multiples), there are 25 companies currently in the energy sector in the S&P 500 Index, spread across a variety of businesses from integrated oil majors, to independent exploration and production companies, to refiners, to pipeline operators, to oil service companies. Additionally, I added Sempra Energy to the valuation comparison matrix, which is a utility that is building substantial liquefied natural gas exporting capacity, for comparison purposes. SRE trades at a current 16.5x EV/EBITDA multiple, which is a little bit cheaper than leading LNG exporter Cheniere Energy (LNG), which trades at a 19.2x EV/EBITDA multiple. Some firms, like Schlumberger are still, somewhat surprisingly, relatively expensive, with SLB trading at an 11.6x EV/EBITDA multiple, even after SLB's stock price declined -45% in 2018 (and rising 28% YTD in 2019), while others are surprisingly cheap, including ConocoPhillips, whose shares have risen only 7.9% in 2019, even with $WTIC oil prices higher by roughly 40%, trading at only a 5.3x EV/EBITDA multiple. The cheapest company on an EV/EBITDA multiple basis in the S&P 500 Index is Cimarex Energy, which I have covered as an analyst for almost two decades now, trading at a 4.2x EV/EBITDA multiple, after rising 10.5% YTD in 2019. From my personal perspective, the best values from an EV/EBITDA multiple perspective, are in out-of-favor energy companies not on this list, and this is primary focus of our private research. Energy equities as a percentage of the S&P 500 Index are near historic lows, and a much lower percentage than at the end of 2013, or even the end of 2016, when oil prices were actually lower. This divergence is setting up a tremendous opportunity into the energy sector as a whole, and an even better opportunity in out-of-favor energy equities that own top quality assets, including Chesapeake Energy (CHK), which I authored a public article on Seeking Alpha, the latest in a series of public articles on CHK, that was just published. The almost ideal template is what Exxon Mobil, which I also wrote a recent public article on, was able to accomplish from 1980 to 2000, compounding shareholder value, even in a range-bound energy price environment, that was actually worse than it seemed after the impact of inflation. 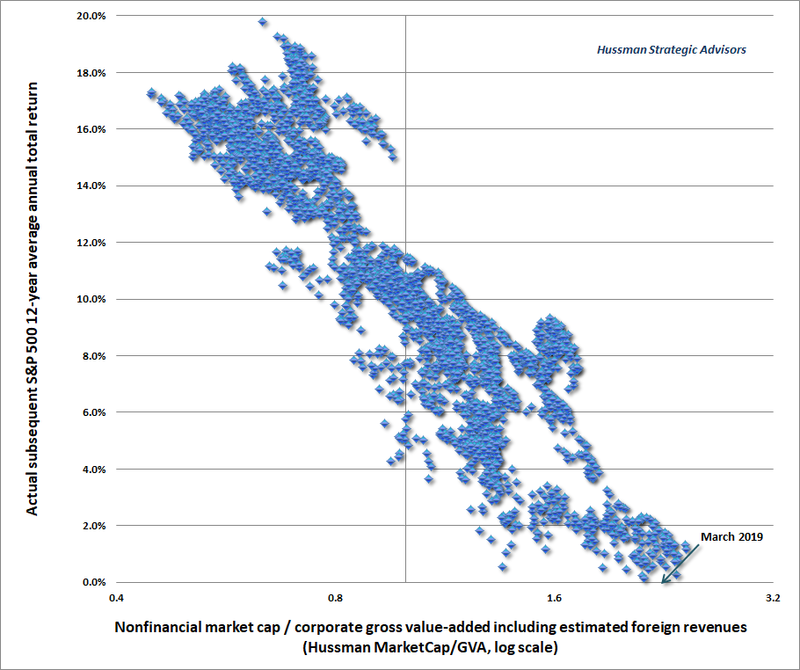 In summary, once the bond market rolls over once again, look for a capital rotation, highlighted by a move from growth-to-value that has a chance to rival or exceed the capital rotation that took place from 2000 to 2002. Disclosure: I am/we are long CHK, DVN, KMI, XOM, AND SHORT SPY AND AMZN AS A MARKET HEDGE. I wrote this article myself, and it expresses my own opinions. I am not receiving compensation for it (other than from Seeking Alpha). I have no business relationship with any company whose stock is mentioned in this article.